Most philosophers did not intend to invalidate conceptual knowledge, but its defenders did more to destroy it than did its enemies. They were unable to offer a solution to the ‘problem of universals,’ that is: to define the nature and source of abstractions, to determine the relationship of concepts to perceptual data—and to prove the validity of scientific induction.... The philosophers were unable to refute the witch-doctors claim that their concepts were as arbitrary as his whims and that their scientific knowledge had no greater metaphysical validity than his revelations. The differences in these two arguments is mostly terminological. Weaver seems more focused on the relation between universals and what he calls "transcendentals," by which he means, moral law. Rand, on the other hand, stresses the link between universals and knowledge in general, particularly "scientific" knowledge, which she contrasts with religious revelation. However, when we examine IOTE more closely, we find that Rand shares Weaver's passion for moral universals. The attack on universals, for both Rand and Weaver, is primarily an attack on the moral foundations of Western society. The issue of concepts (known as "the problem of universals") is philosophy's central issue. Since man's knowledge is gained and held in conceptual form, the validity of man's knowledge depends on the validity of concepts. But concepts are abstractions or universals, and everything that man perceives is particular, concrete. What is the relationship between abstractions and concretes? To what precisely do concepts refer in reality? Do they refer to something real, something that exist--or are they merely inventions of man's mind, arbitrary constructs or loose approximations that cannot claim to represent knowledge? The problem of universals is an ancient problem in metaphysics about whether universals exist. Universals are general or abstract qualities, characteristics, properties, kinds or relations, such as being male/female, solid/liquid/gas, or a certain colour, that can be predicated of individuals or particulars, or that individuals or particulars can be regarded as sharing or participating in. For example, Scott, Pat, and Chris have in common the universal quality of being human or humanity. While many standard cases of universals are also typically regarded as abstract objects (such as humanity), abstract objects are not necessarily universals. For example, numbers can be held to be particular yet abstract objects. Rand's version of the problem of universals is different from Wikipedia's. Now I have no interest in getting into an argument over which version is "correct." Wikipedia is merely relating how the mediavals originally framed the problem. Rand was far more interested in the epistemological side of the issue. In fact, she pretty much ignores the metaphysical issue — so much so that it is not always clear how to characterize Rand's position on universals. Without explicitly saying so, Rand seems to reject the view that universals exist in reality. Instead, she seems to adopt a version of conceptualism. Only particulars exist in reality; but concepts (which for Rand are identical with universals) correspond "objectively" to multiple instances of particulars in reality. But how do they do so? Rand replies: A concept refers to a group of particulars in reality possessing characteristics in common which differ only in their measurements. This, however, is rather vague. 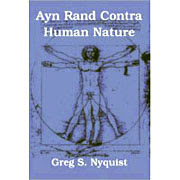 Rand attacked nominalism for regarding "abstractions" as mere "'names' which we give to arbitrary groupings of concretes on the basis of vague resemblances." [IOTE, 2] But why isn't Rand's own theory guilty of the same charge? What makes her theory "objective" and nominalism "arbitrary"? Rand never explains, she merely asserts. "The reason I got involved in business, by and large, if I had to credit one thinker, one person, it would be Karl Marx..."
"The reason I got involved in warfare, by and large, if I had to credit one thinker, one person, it would be Mahatma Ghandi..."
"The reason I got involved in Judaism, by and large, if I had to credit one thinker, one person, it would be Mahmoud Ahmadinejad ..."
Note that Moore says nothing about the problem of universals and its relation to concepts. That connection Rand made on her own. I'm not aware of any major modern philosopher who has ever suggested that the failure to solve the problem of universals invalidates conceptual knowledge. Most modern philosophers ignore the whole issue. If they discuss the issue of universals at all, it is only in passing. This is a very poor argument. Indeed, most of Rand's "stolen concept" arguments, particularly those relating to epistemology, are very poor. All "attacks" on the senses are ultimately attacks against the view that knowledge refers to something "out there," in "reality." Such attacks cannot be regarded as claims of knowledge; rather, they are radical denials of all knowledge. Although such denials are not true, they are not self-contradictory. But even if they were self-contradictory, it would not help Rand's case. Merely because someone makes a bad argument against x does not prove that x is "necessarily valid." Bad arguments against the validity of the senses cannot be used to establish the validity of the senses! Objectivist Theory of Perception. When it comes to the issue of perception, Rand tries to have it both ways. She seeks to be a direct realist while at the same time evading the charge of being naive or overly literal. She developed a theory that came suspiciously close to representationalism, but she fiercely denied being an indirect realist. Rand rejects the view that some perceptions are of the qualities of objects as they are independently of us (primary qualities), whereas others (secondary qualities) are caused by the primary qualities, and are entirely in the mind. Instead, she distinguishes between the content of a perception and its form; when we perceive an object as, e.g., square and red, what we perceive are its intrinsic features in a certain form, a form that is determined by the nature of the object, the nature of our perceptual organs, and the environment. Thus, we perceive the object's shape as square, and the reflectance properties of its surface as red; both are the result of the interaction of our perceptual organs with what is out there. Neither squareness nor redness belong either to the object apart from our mode of perception, or to our mode of perception apart from the object in its environment. Hence, these attributes are neither intrinsic nor subjective but relational and objective. Thus while Rand is a direct realist in the sense explained above, she is not a naive realist in the sense of regarding all perceived attributes as enjoying equal extramental status. The point in dispute involves the term "extramental." As far as I know, that is not a term either Rand or Peikoff have ever used. Its use is required only because Objectivists have never told us whether percepts are mental or not. That is an issue they have artfully dodged, and here is why: if they were to admit that percepts are mental entities (as they admit, for example, that concepts are), they would be confessing that their realism is indirect and perhaps even representational. So when the Stanford Encylopedia decided to do a write-up on Ayn Rand (under the advisement of such Objectivist worthies as David Kelley and Gregory Salmieri), they had no choice but to describe percepts as "extra-mental."